I was pleasantly surprised to get a box of yummy goodies from Smuckers. This box is like a Christmas holiday survival kit. 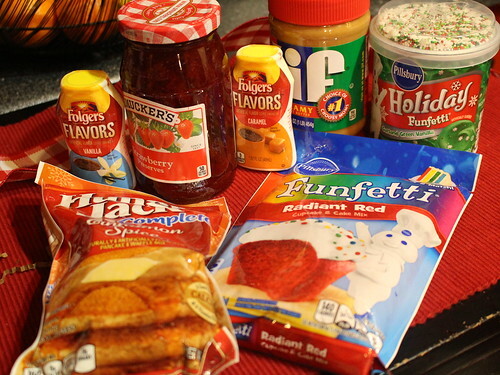 Instead of Christmas cookies, I will be making Christmas cupcakes with the Funfetti mix. Since the family is having ham for the holiday dinner, I place to eat some ham with blue cheese and strawberry preserves. The cinnamon spice pancakes will be even better with whipped candied yams added to the mix. Finally, our house is a Folgers coffee-drinking house so the vanilla and caramel flavors are nice additions.